Only about 150 million people lived in cities in 1900. By 2000, it was 2.8 billion, a 19-fold increase. In 2008, more than half of the global population, 3.3 billion lived in cities, making our kind, for the first time, Homo urbanus – an urban species. By 2030, 5 billion people will live in cities. Cities probably emerged from a network of villages, established in the Middle East and beyond between about 9000 and 4000 BC, from which the two great civilizations of Mesopotamia and Egypt developed and the city first emerged. But the process of large-scale urbanization has its origins partly in the development of industrialization and through the colonial influence. London was the first to reach the magic figure of one million, a population not attained by Paris until the mid-nineteenth century, New York until 1871, Berlin until 1880, and Vienna until 1885. At the beginning of the twentieth century, just 16 cities in the world—the vast majority in advanced industrial countries-contained a million people or more. Today, almost 400 cities contain a million people or more, and about seventy percent of them are found in the developing world. And there are 19 megacities with 10 million or more inhabitants. Cities drive national economic growth. The growth of cities in emerging markets is driving the most significant economic transformation in history. Over 440 emerging cities in the developing world will contribute to $23 trillion or 47% of global growth by 2025. The top 100 American metropolitan areas, home to 65 percent of the population generate 75 percent of the GDP. Home to under 10 percent of Kenya’s population the City of Nairobi generates over 45 percent of Kenya’s $42.5 billion GDP. Over $10 trillion of additional investments will be needed in cities by 2025. There will be 1 billion new consumers in emerging markets by 2025. 80 billion cubic meters of additional water will be needed by cities in 2025. Globally, and especially in emerging cities, the building boom will require nearly $80 trillion. China plans to spend $6.5 trillion on urbanization to bolster economic growth. The capacity of ports to handle global container traffic will have to grow by 2.5 times from today’s levels. As cities grow, managing them becomes increasingly complex. The speed and sheer scale of the urban transformation in the developing world presents formidable challenges. In many ways, rapid growth in Africa’s urban population is associated not with wealth but squalor and poverty. Available data suggest that in a large number of the world’s poorest countries, the proportion of urban poor is increasing faster than the overall rate of urban population growth. An estimated 72 percent of the urban population of Africa now lives in slums. Moreover, a majority of cities in the developing world have become victims of the their very modest growth. The automobile and the highway have produced neither connectivity nor mobility but gridlock. We have sacrificed the human dimension – open spaces, sidewalks, bicycle lanes and street furniture – at the altar of streets and parking lots. We have forgotten that life really happens on foot. Regardless of their planning and ideologies and economic growth calculus, those who run our urban areas must remember that life in the city happens not on the superhighways or the automobile or in skyscrapers, but on the streets and sidewalks and in open green spaces. Our food, water, energy, solid waste and sanitation systems are stretched to the limit. Neighborhoods and drainage systems are chocked by solid waste; our rivers are open sewers; our air is foul; our soils are poisoned. Pockets of revolting wealth exist side by side with unconscionable squalor, depravation and poverty. Socio-economic inequality threatens to tear our common bonds of humanity and citizenship. Hunger and malnutrition are marching on our cities. 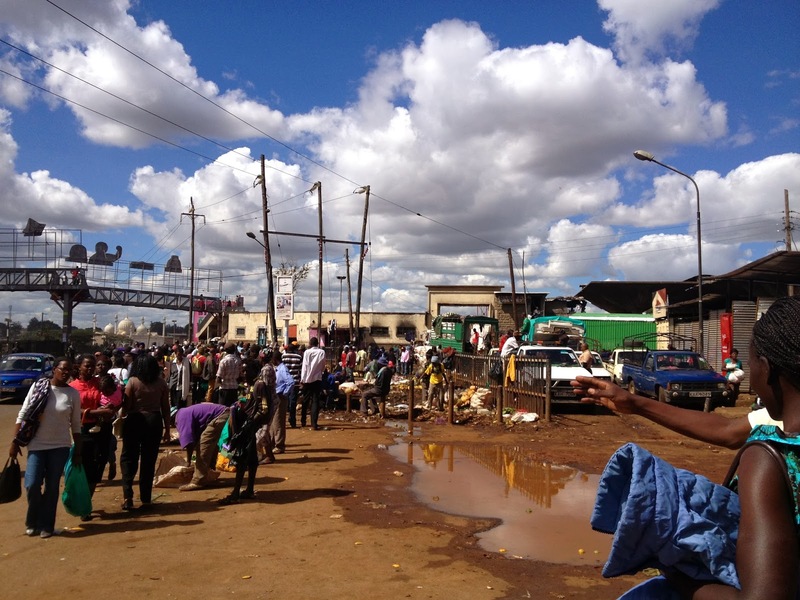 A recent study showed that 44 percent of households in Nairobi were under nourished. In May 2012, the Ministry of Special Programmes, distributed 4,800 bags of rice and soya and another 400 tins of cooking oil to poor households Nairobi, where it was estimated that 65% were food insecure. Meeting the next round of global targets toward the eradication of extreme poverty and hunger, universal education, equitable access to water and sanitation will depend on how well developing countries manage urbanization. What kind of city do you want for yourself and your children?